Welcome new families and welcome back returning families. School officially began this week for all students. The start of a new school year is such an exciting time to meet new people, reconnect with friends, and reflect on your goals for the coming year. One goal that I am most happy to share with you is our push to have more parent communication between parents, staff, and teachers. It feels like we are going back to our roots of how we started in 2010 as a homegrown charter school. I want the parent buy in that we had and continue to have to be reinvigorated this year. This year, teachers will reach out to parents more and break down any walls that exist between parents and teachers, which shouldn’t exist but we know sometimes does. Some of the barriers that arise between parents and teachers are previous bad experiences either with the teacher or a parent, language barriers, or age difference when a teacher is very young and they feel insecure speaking to parents. When I started teaching, I was timid and nervous when talking to parents. Since that first year, parent-teacher relationships have been important to me, even the hard conversations. I’m even more sensitive now that I have a daughter entering her first year of school. We’re going to break down the parent/teacher barriers by providing professional development for staff as well asproviding multiple opportunities for teachers and parents to come together and communicate. We will have more parent events this year. More fun parent events: a mother daughter spa afternoon, Halloween night, potluck dinners, community service and a variety of other events that will happen each month. In the past, parents sometimes felt that they were not able to go on trips as chaperones and we want to dispel that myth. There will be caps to the number of parent cha perones but we want parents to go on field trips with kids, especially in the middle school but we encourage it in all grades. I’m encouraged about our Parent Council and welcome Ms. Lourdes Fernandez and Ms. Jhoselyn Almonte as respective heads of our new High School and Middle School Parent Councils. 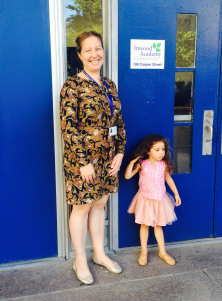 Ms. Nancy Betances, who many of you know and love, is taking on the new role as our Middle School Parent Coordinator. “I am very happy that we have this Parent Council forum for us” says Ms. Fernandez. We will be meeting every other month and we want you there. The parents who are part of the Parent Council know we can’t do this alone. We need as much help as we can get. We welcome you.” Please join parent Ms. Fernandez and Ms. Almonte, along with Ms. Betances at their parent meetings. For dates, see Parent Council. I feel that the parent involvement will push us to be better as a school and when kids see their parents involved in the school it provides additional accountability for them. This also means that there’s going to be stronger safety net for the kids.